Moussaka is an aubergine-based dish of the Balkans and the Middle East. Though it is part of all the cuisines of the former Ottoman region and has an Arabic name (which means "chilled"), in the West, it is best-known in its Greek form. All versions are based primarily on sautéed eggplant (aubergine) and tomato, usually with minced meat. The Greek version, which is the best-known outside the region, includes layers of meat and aubergine topped with a white sauce and baked. Turkish musakka, unlike the Greek version, is not layered. Instead, it is prepared with sautéed aubergines, green peppers, tomatoes, onions, and minced meat. It is eaten with cacık and pilaf. There are also variants with zucchini, carrots and potatoes. In the Arab world, moussaka is a cooked salad made up primarily of tomatoes and aubergine, similar to Italian caponata, and is usually served cold as a mezze dish. 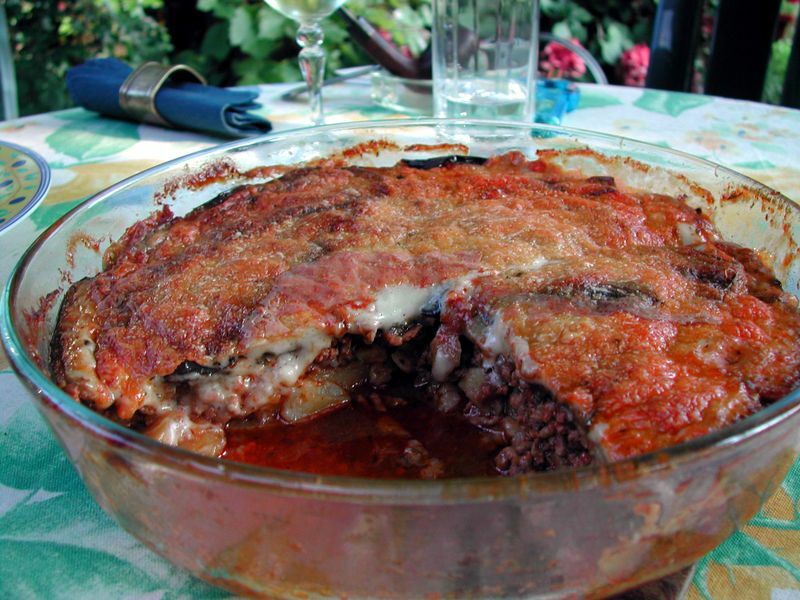 In the usual Greek three-layer recipe, the bottom layer consists of aubergine slices sautéed in olive oil; the middle layer is ground lamb cooked with onion, garlic, chopped tomatoes, herbs, and spices (cinnamon, allspice and black pepper); and the top layer is a béchamel sauce or egg custard. Each layer is cooked on its own and then they are layered in a pan and baked until the top layer is browned. Moussaka is usually served lukewarm, as it keeps its shape better. In the rest of the Balkans, the top layer is often a custard. Grated cheese or bread crumbs are often sprinkled on top. There are variations on this basic recipe, sometimes with no sauce, sometimes with other vegetables. The most common variant in Greece may include courgette, part-fried potatoes or sautéed mushrooms in addition to the aubergine.